In the post-ICD-10 era, more organizations are eschewing external vendors in favor of pulling auditors from their in-house coding ranks. When it came time to bring the auditing function in-house, Renee Petron, RHIA, hit a seemingly impassable roadblock. "We did not have a robust pipeline. The candidates we saw had little to no auditing experience. And those who did have the experience just didn't align with our compensation package," says Petron, director of coding quality review at Parallon Business Performance Group, a subsidiary of Hospital Corporation of America. Parallon needed to hire not one but many inpatient and outpatient coding auditors who would be responsible for auditing coders in all eight HIM shared service centers. When the search for candidates continued to leave Parallon with auditor vacancies, Petron decided to take a different approach, creating a grow-your-own auditor program that provided several internal inpatient coders with the education they needed to become auditors. Petron began by designating a high-performing team member as project lead. This individual not only created all educational materials, she also helped onboard new auditors-in-training, including identifying skill gaps and providing refresher training as necessary. To date, Parallon has trained 10 coders to become auditors through its three-month internal training process. Grow-your-own auditor programs continue to increase in popularity as hospitals struggle to find qualified candidates, says Laurie A. McBrierty, MLT, ASCP, vice president of product management at Career Step. "There's such a shortage of coders, so trying to get a coder to become an auditor is even harder," she says. This is particularly true for facilities in remote or rural areas, says Christopher Gaarlandt, MSBI, RHIA, CDIP, director of coding, quality, and performance at nThrive. "They focus on growing what they have in order to meet their business needs," he says. Organizations are at the point post-ICD-10 where they can finally reassess the necessity of external vendors—particularly those performing the audit function—and try to refocus those dollars internally, says Julia Hammerman, RHIA, CPHQ, director of compliance and education at himagine Solutions. • reduced costs related to outsourced auditing. "You can also keep a pulse on [auditors] and make sure that no bad habits are ultimately developed," Gaarlandt says. One disadvantage to developing in-house auditors is the amount of resources needed to do the job right. "Unless you have a dedicated educator, you're ultimately going to take some of your audit staff out of commission to do some of the mentoring," Gaarlandt says. "You'll also need to do an initial audit and probably ongoing audits of your newly transitioned auditor. That's going to take some of your current staff out of productive QA [quality assurance] to audit, coach, and mentor the new ones. It's a hit up front for a long-term gain." Also, such initiatives often leave a coding vacancy, McBrierty says. 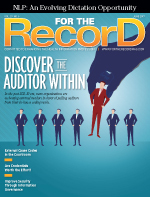 Pamela Pareti, RHIT, director of HIM at Slidell Memorial Hospital in Louisiana, hopes to avoid a productivity hit by training an experienced per-diem coder to become a part-time auditor. The hospital is in the early stages of making the transition. "We reached out to her and asked if she'd be interested in doing auditing instead of coding. She jumped at the chance and said she'd love the opportunity," Pareti says. To obtain executive approval for the additional one-half FTE, Pareti reduced her consulting budget by that same amount. Like many hospitals, Slidell Memorial couldn't find a qualified inpatient auditor despite posting the position for more than two months. "It's like trying to find a good coder—there are only so many out there," Pareti says. In lieu of continuing to rely entirely on outsource auditors, Pareti's willing to take a chance on developing internal talent. "The whole idea is to be able to supplement what we're already doing," she says. "I'd love to get double or triple the audits, but I can't. This is a way to get more audits done without increasing my department budget." A grow-your-own auditor program is not an entirely new concept for Slidell Memorial. Pareti's coding supervisor, Cecilia Brogdon, previously grew two outpatient coders into inpatient coding roles using an internal mentorship program. "We would use the same theory and process with our auditor," Pareti says. Once developed, the training will incorporate various best practices the hospital has gleaned from working with multiple outsource vendors. Pareti also plans to incorporate coder feedback, including identifying the audit methods and processes that have been most beneficial in the past. For example, if a particular external auditor has a high satisfaction rate among coders, Pareti wants to understand what was unique to that individual's approach and adopt those same techniques and strategies into Slidell's training program. The University of Pennsylvania Health System is another facility in the process of growing its own auditors. A dearth of qualified candidates possessing the necessary three to four years of coding in an academic medical center was the impetus behind the creation of the Penn Medicine Coding Academy, says Jennifer Ritter, RHIT, CCS, who is overseeing the program. As the systemwide training provider, Ritter has experience transitioning staff members from one role to another. Penn's grow-your-own program has helped nine recent HIM graduates become coders, one of whom has since been promoted to auditor status, working alongside external auditors to review cases at each of the health system's four hospitals. The new auditor didn't receive formal training; instead, he underwent intense supervision for one month. Ritter says his coding and communication abilities made him well-suited for the job. "He was an excellent inpatient coder, which is why I think he's such as an excellent inpatient auditor," she says. First and foremost, the coder must have several years of acute care coding experience, Hammerman says. "Your auditors need to be stronger than your best coders," she says. Parallon requires candidates to have at least five years of recent coding experience and a 95% accuracy rate to be considered for an auditor position. It also leans on coding and auditing competency assessments to determine readiness. Some hospitals have even stricter requirements. "We have a heart center at our hospital, so we do a lot of cardiac cath cases," Pareti says. "We're looking for someone with a lot of acute care experience who is very skilled at coding the highest level of cardiac cath cases." Organizations need to think about whether an in-house coder has the skillsets to perform the specific types of audits that will be targeted, Gaarlandt says. For example, if the hospital intends to audit sepsis cases, the coder-turned-auditor must demonstrate a high proficiency in sepsis coding. The coder must also have an open mind and be willing to consider other viewpoints. "Do they have the skills to work in a gray world? Auditing is not black and white—it's gray. You need someone who can work in this world," McBrierty says. The ability to communicate effectively is paramount. "They're looking at their former coworkers' charts, so you want to make sure that they communicate with respect," says Ritter, adding that other skills such as the ability to multitask, think critically, and lead others are equally as important. It's a tall order to fill, Pareti says. "Not every coder can be an auditor—it takes a special person," she notes. When it comes to auditor training, there is no one-size-fits-all solution. Some organizations partner with an external vendor using a formal curriculum or a patchwork of courses. Others develop training materials internally. • health care law and regulations. Because auditors will likely use pivot tables to track and analyze results, they should also be familiar with Microsoft Office, particularly Excel, McBrierty says. A review of medical terminology, anatomy, and physiology is also warranted, Gaarlandt says. "Because they are shifting that mindset into an auditing role, it is really important that nothing is overlooked," he explains. "So it would be best practice to have them rehash the medical terminology, the A&P [anatomy and physiology], and the guidelines. There's just so much content there that no matter how familiar you are, you're always going to absorb more." Last, but certainly not least, McBrierty says auditors should receive communication-related training so they are able to communicate positively and with empathy when interacting with colleagues, managers, and even health care executives. Ensure that the auditor can research potential coding errors and omissions, cite resources, and provide clear and concise feedback both verbally and in writing, Gaarlandt says. It's also important for auditors to be objective and willing to reevaluate findings, Hammerman says. "Coders should be given an opportunity to provide a rebuttal to their audits. An auditor needs to be able to recognize when the coder is correct," she says. Gaarlandt recommends assessing proficiency throughout the training process. Online modules usually include a built-in assessment component, making it easier for managers to track progress, he says. Otherwise, be sure to review the auditor's findings as he or she begins to work on actual records. Plan to provide some type of job shadowing/mentoring for the auditor in training, says Hammerman, adding that this may be the most difficult aspect of starting a program. "Some organizations don't have audit resources. Who will help mentor this person? That's what has become a stumbling block for organizations," she says. Educational vendors may be able to fill this gap by providing the didactic component of the training and serving as a mentor throughout the process, Hammerman adds. Another option is to work with an external auditor that provides the first-level review so the auditor-in-training can tackle a second-level audit. This helps organizations build their own internal audit team in parallel with any outsource services, McBrierty says. Organizations may also want to consider auditing software that can help select charts using a rules-based engine, provide a data-entry tool for audit results, and perhaps even help train auditors in terms of what to look for, says Sandy Brewton, RHIT, CCS, CHCA, a senior health care consultant at Panacea Healthcare Solutions. "It cuts down on some of the confusion of learning how to perform the audit," she says. Without these types of automated tools, it could take an auditor more than two hours, on average, to audit a single inpatient record, McBrierty notes. • Have denials increased? Decreased? Remained the same? • Is there revenue loss associated with one or more diagnosis-related group? • Has coding quality increased? Decreased? Remained the same? Examine the audit results. "If you completed an audit and didn't find any errors, I would be a little suspicious of whether it was working or not," McBrierty says. Even after growing their own internal auditor, some organizations may find they want to continue working with an external vendor in some capacity. "I believe there's always a need for an outside set of eyes," Pareti says. An external vendor can also help audit the auditor—something that organizations should plan to do at least quarterly, Hammerman says. In addition to measuring the program's metrics, ask for anecdotal feedback from coders, Gaarlandt suggests. For example, ascertain whether the auditor's feedback is helpful, consistent, and clear. Also obtain feedback from the new auditor, Ritter says. Is the process working? Are coders, physicians, and others responding favorably? By gathering all of this information, providers will get a better read on the financial and organizational repercussions of taking a homegrown approach. • Plan ahead. Experts agree that training a coder to become an auditor can take several months. • Don't underestimate the importance of communication skills. This is especially true for auditors who eventually will work remotely, says Renee Petron, director of coding quality review at Parallon Business Performance Group. • Seek executive buy-in. Not only will you need time and resources for a coder-to-auditor transition, but you may also need funding for contract services to fill a subsequent coding vacancy, Petron says. • Take your time finding the right coder. You don't want to invest in training only to discover that the coder isn't really interested in auditing, says Christopher Gaarlandt, MSBI, RHIA, CDIP, director of coding, quality, and performance at nThrive. • Choose the right mentor. "Make sure that your top performers are the ones doing the coaching," Gaarlandt says. • Provide comprehensive auditor training. "You can't just give someone a little bit of education, set them out on their own, and expect them to be successful. They need to be mentored and get constant feedback on how they're doing," says Julia Hammerman, RHIA, CPHQ, director of compliance and education at himagine Solutions. • What specific training does the vendor offer? What topics does it cover and who is the target student? Does it include training for "soft skills"? • What's the training cost? • What's the duration of the training? How long will it take the coder to become a productive auditor? • Who developed the training? What qualifications did these individuals possess?